Financial Distress? There Is an Answer…. In the following excerpt the Infant of Prague is called the Patron of Financial Distress. Yes He is…and He helps in so many other ways, too! After 30 years of here and there wishing for a lovely statue of the Infant of Prague, hubby ran across one at an estate sale! Imagine that! And with all the colorful gowns and 2 crowns! What a find! It is not the statue, of course, that makes this devotion possible. It is our heart’s devotion, the prayers we say to Him…AND He does especially help with finances! Who, in their married life, doesn’t need help with finances at some time or other? Here He is watching over things for the summer on top of our covered wood stove. I had Him dressed in red for the Precious Blood since it is July but halfway through I changed him to this lovely peachish orange…a summery color! I go to Him for many things and when there is an urgent need (and I find that those come up often in a big family) I will do the 9 hour Infant of Prague Emergency Novena. I am including that novena at the end of this post. We have so much amazing help at our fingertips….POWERFUL help! And that is why I am sharing this with you….we all need help. And many times, it can be financial…which is a true stress! 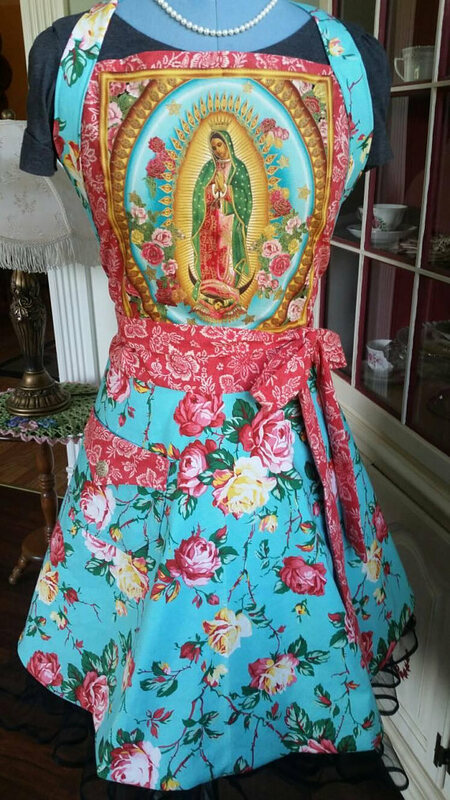 So….turn to the Infant of Prague in your needs. And if you can find a small statue somewhere (we have a smaller, very nice one that was given to us by a friend and that we use also…pictured below), spend the money on it, get it blessed and put it in a place of honor. He will take care of you! Honoring the Infant of Prague is a tradition that is kept in many homes throughout the world as some believe that it guarantees financial stability and abundance. There are several novenas to the Infant of Prague, one reflecting the intensity of an emergency situation, is to be done in one day’s time, the prayer said once every hour for nine hours in a row. Devotion to Christ as a young child dressed as a king has its roots in the Carmelite order of Spain. According to tradition, in 1555, Saint Teresa of Avila gave a statue of the Christ child, dressed in actual royal robes to a noblewoman who was marrying into an aristocratic family in Bohemia. Taking it with her to what is now the city of Prague, her daughter, the Princess Polysena inherited it. In 1623, Princess Polysenia was widowed and chose to devote the rest of her life to charitable causes. The monks credited this image with the immediate upturn of their fortunes. When they were forced out of their monastery due to a war in 1631, they left the statue behind and the invading army threw it in a rubbish heap. Within seven years the Carmelites were back in their monastery in Prague, desperately attempting to rebuild it. One monk, Father Cyril, who had a particularly strong devotion to the Divine Infant found the little wax statue among the rubble. The only damage done to the statue was its crushed hands. After the statue was repaired, the monks again displayed it in the main church. As the city of Prague suffered an epidemic, parishioners began invoking the little statue for aid. The quick answer to their prayers brought many in the surrounding region to seek help. Gradually, the devotion spread to many other countries. Today, the church in Prague built to hold the statue, Our Lady of Victory, is a site of pilgrimage with visitors from all over the world paying their respects to the Divine Infant. O Jesus, Who has said, “Heaven and earth shall pass away but My word shall not pass”, through the intercession of Mary, Your Most Holy Mother, I feel confident that my prayer will be granted. O Infant Jesus, I run to You, begging You through Your Holy Mother to save me in this need (you may name it here), for I truly and firmly believe that Your Divinity can defend me. Full of trust I hope in You to obtain Your holy grace. I love You with all my heart, I am painfully sorry for my sins and on my knees I beg You, o Little Jesus, to free me from them. O Little Jesus, I adore You, o Mighty Child, I implore You, save me in this need (you can mention it here), that I may enjoy You eternally, with Mary and Joseph see You and with all the angels adore You. Don’t forget to sign up for the Giveaway to win one of 2 Catholic Mother Goose Volume Two – New Poems, Full, Vibrant Color! New items at Meadows of Grace! Come and stop by! I love this devotion to the Infant of Prague and have a small statue of the Infant at home. I highly recommend this devotion to everyone. It is lovely to see these little devotions being promoted – so many seem to have been forgotten over the years. Thank you for sharing this! My husband is always stressed about money, and we are about to adopt a special needs child! I’m also leaving my job post adoption to be a stay at home mom. A friend recommended this devotion just days before this post. How providential!